Hmm, what to make for dinner? This was certainly a perplexing question the other day. 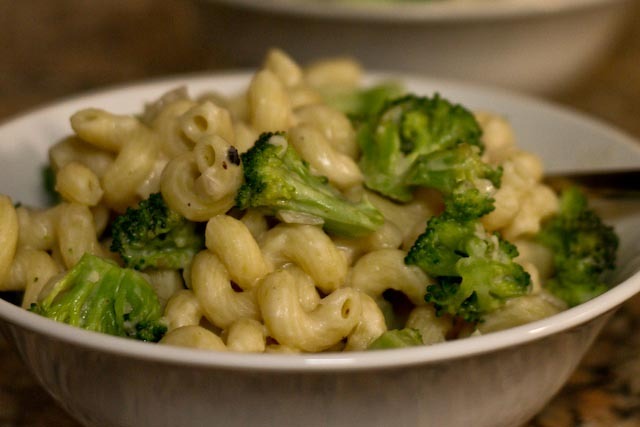 I happened to have on hand a very large head of broccoli, a few cans of cannellini beans in the pantry, some curly pasta, and onions. But what to make with it? And then it hit me. 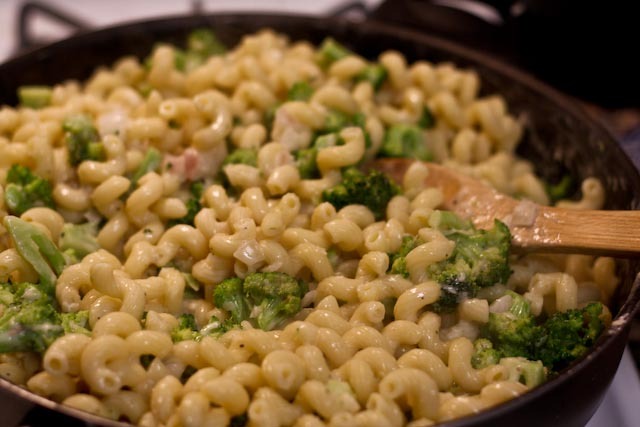 I could use the beans to make a creamy “alfredo” like sauce to go with pasta and broccoli! Yes! 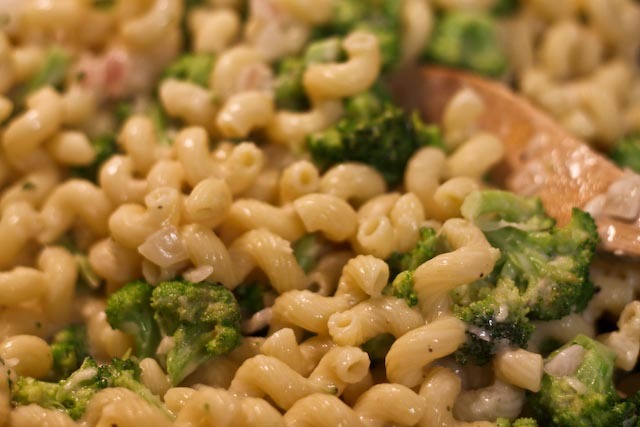 We would have creamy pasta and broccoli for dinner. And as an added bonus, there’s about 500 less calories in this dish than if I made it with a real alfredo sauce. So how ’bout that!? 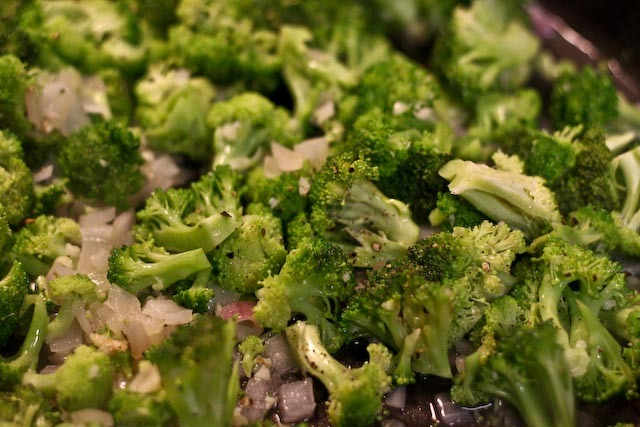 Broccoli sauteed with onions, garlic, salt, pepper and a little water to help it steam. You really don’t want to overcook the broccoli here. It would just be mushy and sad. I stirred in the paste along with my homemade sauce concoction of very well pureed cannellini beans and a few tablespoons of cream cheese (ricotta would also be fantastic, but I had cream cheese in the fridge, and went with that). Smooth, creamy goodness – and without a ton of cheese or heavy cream! In a food processor, puree the can of cannellini beans until they are a smooth, creamy texture. Set aside. In a large pot, bring water to boil for pasta. Add pasta and boil for about 9 minutes or until tender. Reserve 1/2 cup of pasta water and set aside. Drain pasta. Meanwhile, drizzle a large, deep-sided saute pan with olive oil and set over medium heat. Add onion and garlic and cook for about 5 minutes, or until onion is translucent. Add broccoli florets and season liberally with salt and pepper. 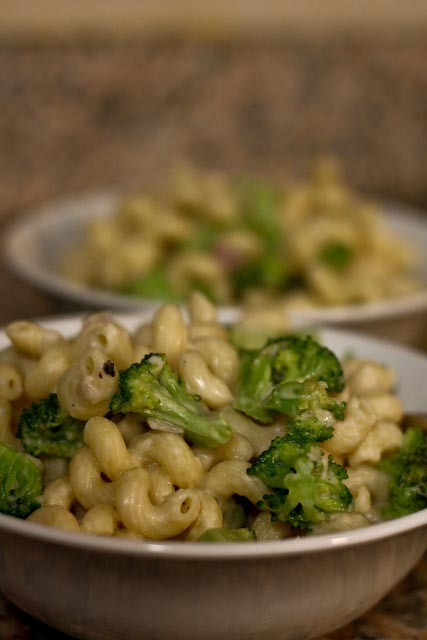 Add pasta water, cover pan with a lid, and let broccoli steam for about 5-7 minutes. When broccoli is tender, but still a bright green, add pureed cannellini beans and cream cheese and stir well to combine. Add pasta and toss to coat pasta with sauce. Remove from heat and serve warm. Sprinkle with Parmesan, if desired.